Nikon Canada Inc. is pleased to announce the release of three new lenses designed for the next-generation Nikon Z mount system's full-frame (Nikon FX format) mirrorless cameras, for which a new larger-diameter mount has been adopted. The three new lenses are the standard zoom NIKKOR Z 24-70mm f/4 S, the wide-angle prime NIKKOR Z 35mm f/1.8 S, and the standard prime NIKKOR Z 50mm f/1.8 S. Nikon has also announced the Mount Adapter FTZ for Z System compatibility with existing NIKKOR F mount lenses and development of the NIKKOR Z 58mm f/0.95 S Noct lens. Nikon is currently developing the NIKKOR Z 58mm f/0.95 S Noct, a standard prime manual focus lens and the fastest lens in Nikon’s history. The design of the Noct lens exemplifies Nikon’s mission to pursue the ultimate optical performance in the mirrorless category. As a result, the Noct is positioned it at the top of the S-Line. In addition, Nikon is planning on releasing a variety of new lenses that will continue to expand its line of attractive, high-performance NIKKOR Z lenses that further extend photographers' creative expressions. 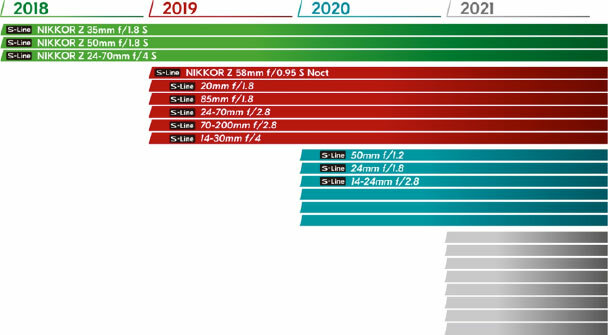 The NIKKOR Z 58mm f/0.95 S Noct that Nikon is currently developing will be a large aperture, standard 58mm prime focal-length, the fastest lens in Nikon’s history*1, manual-focus lens positioned at the very top of the S-Line. It will stand to symbolize the Nikon Z mount system's new dimension in optical performance. It has inherited the design concept behind the original AI Noct-Nikkor 58mm f/1.2, a standard prime lens released in 1977, named for “Nocturne” (a musical composition inspired by or evocative of the night), that was popular for its ability to finely reproduce point light sources as point images. This new Noct lens that is currently in development will take advantage of the advanced design flexibility afforded by the Z mount, pursuing ultimate optical performance. Development continues with the goals of achieving an extremely fast maximum aperture of f/0.95, offering the ultimate in NIKKOR rendering performance with superior detail and sharpness. Additionally, the goal is to achieve beautiful blur characteristics, or bokeh, with good continuity, and ensure outstanding point-image reproduction capabilities for more compelling, three-dimensional imaging. *1 Within interchangeable lenses for Nikon SLR cameras and Advanced Cameras with Interchangeable lenses. The NIKKOR Z 24-70mm f/4 S, the wide-angle prime NIKKOR Z 35mm f/1.8 S, and the standard prime NIKKOR Z 50mm f/1.8 S will have a manufacturer’s suggested retail price (MSRP)* of $1,399.95, $1,179.95 and $849.95 respectively and will be available in fall 2018*. The FTZ Mount adapter will have an MSRP* of $349.95 (Additional $150 savings when purchased together with a Z 7 or Z 6, through 12/31/2018). and will be available in September 2018. ** For more information about these lenses or other Nikon products, please visit www.nikon.ca.